While browsing through old burned DVDs of HDD back-ups, I stumbled across my Unusual Pictures folder, which includes self-made artwork and interesting photos found on the internet (there’s a sub-folder dedicated to games, which I might repost at a later date). In there I found this bit of MGS3 fan-art. Click the photo to enlarge it to its correct size. 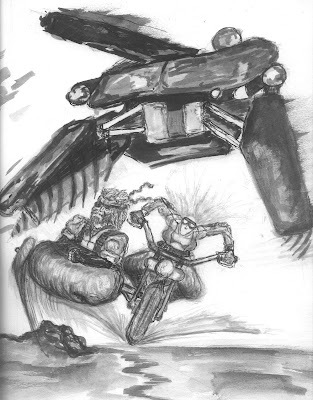 This picture was created by me during The Gamer’s Quarter days, when ShaperMC asked if any staff could draw something for a MGS3 feature they were running. For A-levels at British Upper School I had chosen art, along with Japanese, philosophy and sociology, and became quite a dab hand at it – I had a particular fondness for the inkwork of Yoji Shinkawa and Ralph Steadman, basing one of my portfolio projects on them. So I thought it rather apt to attempt a vaguely Shinkawa-esque piece of art based on MGS3. Sadly my scanner broke at the time so I couldn’t send it in time and, as Wes pointed out, Snake appears to be fapping. It wasn’t that great, certainly nowhere near the level of Persona’s artwork which ended up being regularly used in TGQ. The side car is also grossly out of proportion, as is the side-wheel. Snake appears to be sitting inside a potato. That aside, I’m still happy with it – like most things I do, sheer apathy for humanity prevents it reaching higher plateaus of quality. That's a really nice piece of work, you have talent Sketcz.